Swear by it. Worth it’s weight in gold. In particular hard water areas. I may wash less frequently until the paint hardens. It’s a great colour though, and a brilliant car! I’m not sure the paint will get any harder? Are you using a snow foam or citrus pre wash? I’m not- i’ve thought about snow foam, perhaps I should. There isn’t anything visible on first look, I just don’t don’t want things to get worse. What is a citrus pre wash? The idea of using a snow foam and optionally a citrus based pre wash as well is to loosen and lift most of the dirt before you touch the car. Touching a dirty car with a wash mitt will create swirls (not as much obviously as a closed cell sponge) but snow foaming a car with a good sealant on means the wash mitt part is not really picking up much dirt at all - crucial at this time of year as the car is halfway to been clean already after a powerwash rinse. I’ll start snow foam, before I cause any real damage. I hope this isn’t the start of a slippery slope, there’s no limit to what can be done to keep the car pristine! RaceGlaze is better than the AquaGleam. 0ppm vs 30ppm and the resin lasts longer too. A must in my area otherwise the car looks like it’s been washed in water and flour! 9 years of dark Shadow blue = no issues = Valet pro snow foam + dodo born to be mild. most of my self-inflicted swirls/holograms have happened during the drying process. This. On cars that do not have any protection on them, this is where the vast majority of the swirling takes place, even if you use a really soft drying towel. You can snow-foam, prewash etc etc, but if you're lazy and/or don't have the time to stand in your driveway for half a day, just get the car and wheels ceramic coated and then when you maintenance wash it the dirt and water just glides off. 1. Power jet-wash to lift the dirt and get rid of the surface debris. 2. '2-bucket' wash with PH neutral shampoo, and wash-mits. 4. Dry what water is left (normally very little) with a large drying towel that has some of THIS sprayed onto/into it to ensure the ceramic coating stays in its best possible form. Yes, a poor drying technique can inflict damage. I like to minimise contact with the paintwork during the drying stage. I’ve got a warm air dryer that I use to blow the final rinse water off the car. If the car is well protected, blowing off what rinse water is left leaves very few droplets to pat dry with a good quality absorbent drying towel. 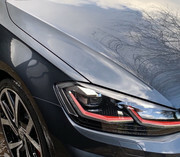 A warm air dryer is also very good at removing the water from all those annoying water traps too, some of which can continue to drip for some time after you’ve finished drying the car (door mirror housings, grilles, door handles, window rubbers, wheel bolt holes etc.). Yes, should have mentioned drying as well. If anyone is still using a Chamois leather - please immediately go and put it in the bin! Using microfibre towel. Just picking up some turtle wax snow foam now!